SermonAudio.com | SermonAudio Tip: SermonAudio Android Devices Edition v2.9.5! SermonAudio Android Devices Edition v2.9.5! We're very happy to announce our support for the Google Android family of phones so that now you can listen to sermons, watch videos, and access other resources on SermonAudio.com -- instantly! It's the SermonAudio Android Edition! It's our wildly popular app for Android devices and here's how it works. Simply go to the Google Play Store on your device and search for "sermons" or "sermonaudio" and download it for free! Or you can simply click on this link! Major Release Version 2.0! Our version 2.0 is a major release that now supports both phone and tablet form factors (landscape + portrait modes). 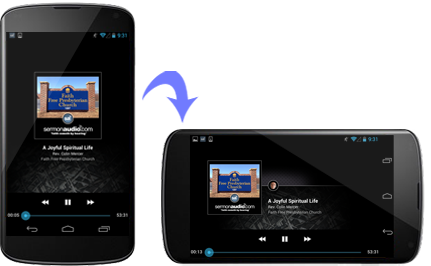 Audio, video, and PDF sermons can now be downloaded to the app for offline enjoyment. The app has been redesigned with native controls and largely rewritten for more robust support of the newer Android devices. Other improvements include: Player auto-resume, click title to jump to sermon, speaker + album graphics. Version 2.0 is only available for Android OS 4+ but older OS versions can still access our 1.9.8 version in the Store under the title of SermonAudio Legacy Edition. New! Android Wear Support! 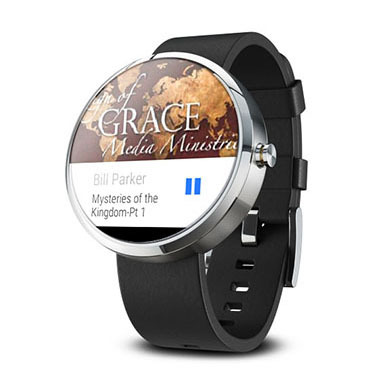 SermonAudio already integrates beautifully well with the Android Wear! See what's currently playing with a glance at your watch or control the sermon's playback (pause/play, fast-forward, rewind) using the watch's interface. New! Version Updates! Version 2.5.6 introduces audio controls on the lock screen (for devices which support this Android feature), a map of your local churches at a glance at startup, an important fix for audio focus, and many small stability enhancements. Version 2.5.7 fixes a problem with audio playback during incoming calls. Version 2.5.8 has several stability fixes. User Feedback: A *great* blessing! First, the app *works*. That is, this is not merely some great idea made a chore or worse with buggy software. Second, this *is* a great idea, and has been for years. User Feedback: If it were possible to give this app SIX stars I would do it! User Feedback: Solid Huge improvement this is a rock solid app. New! Update Version 2.5! Support for sermon sharing via QR codes, export downloads to public storage and Android media player, improved searching with suggestions, grouping downloads by speaker, download notification, and several fixes. New! Update Version 2.1! Auto-retry of playback after network interruption, improved download notification with true progress bar, and numerous fixes. Nook and Kindle tablet users also enjoy the 2.1 update which now includes support for maps! We've worked hard on the user interface making this a visually appealing app for both landscape and portrait orientations. Landscape: Player reformats to include speaker thumbnail. Landscape: On tablets, shows your currently-playing sermon. Landscape: On tablets, shows what others are currently playing. Tablets: Enjoy the map, videos, and sermon transcripts on larger screen. New! QR Scanner and Generator! We've come up with a clever way to easily jump to any sermon using QR codes! With v2.5, you can now scan the QR code for any sermon on SermonAudio and the app will conveniently jump to that specific sermon! It's an amazingly simple concept implemented beautifully! Scan QR codes from the website on your screen or from another mobile device! New! Improved Player with Auto-Resume! The sermon player shows the title, speaker, broadcaster, and album art. It intelligently reformats itself based on screen orientation and tapping on the sermon title takes you to the sermon page. It also remembers your last play position and auto-resumes! Option for continuous playback (or shuffle) when playing downloaded audio! Background Playback Support! Sermons will continue to play even when exiting the app or performing other tasks. Simply click on the HOME or BACK button to switch to another task. To completely stop and unload the player, hit PAUSE first, then BACK. Multi-Bitrate Video Streaming! You can now stream the newest videos over any connection, including 3G, EDGE, or WIFI. Videos uploaded at the higher bitrate on SermonAudio automatically have a lower-bitrate option available! Live Video Webcast Support! You can now watch live video webcasts from supported SermonAudio broadcasters on your Android phone! Our infrastructure allows broadcasters to make available multiple bitrates for high or low speed connections! New! Chromecast TV Integration! 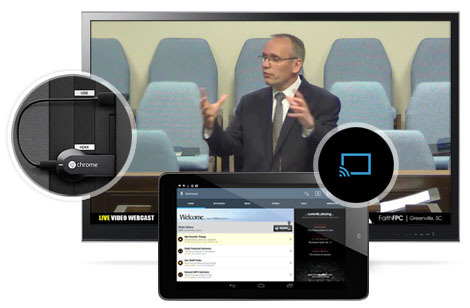 If you own a Chromecast, from your Android phone or tablet, click on the "Cast-To TV" button any sermon or live webcast and enjoy the convenience of watching the selected feature on the big screen! New! Amazon Fire TV Integration! If you own a Fire TV, from your iPhone or iPad, click on the "Fling To TV" button any sermon or live webcast and enjoy the convenience of watching the selected feature on the big screen! Play-To Roku TV Integration! If you own a Roku Device, from your Android phone, click on the "Play-To Roku" button any sermon or live webcast and it will wirelessly send the command to your Roku to start playing on the big screen! Local Church Finder via the MAPS tab. The app will automatically use the built-in GPS to locate your position and show the churches nearest to you! Alternatively, you can search by ZIP code or partial city name. Download MP3+MP4+PDF Sermons! You can now easily download multiple MP3 audios AND MP4 videos directly to your phone or tablet for offline enjoyment! It's perfect for "loading up" on sermons at a coffee shop via WIFI before getting back on the road. 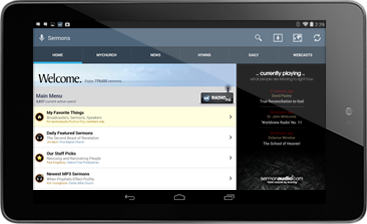 SermonAudio Android Edition allows you to elegantly browse and search through our library of over 1,665,000+ FREE MP3 sermons from thousands of different speakers and listen to any of them immediately on your Android phone! Additionally, you can watch sermon videos (MP4) and even read sermon transcripts (PDF). New! Native support for phones + tablets! New! Built-in audio player shows sermon information and album art. New! Tune into our 24x7 Radio Stream for non-stop preaching+music! New! QR scanner allows you to quickly jump to a specific sermon! New! Remembers the last play position and auto-resumes. New! Robust streaming and background downloading experience. New! 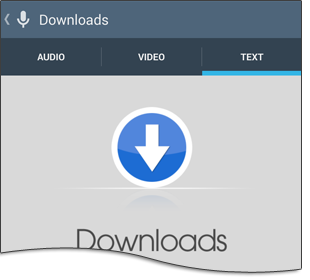 Download MP3+MP4+PDF sermons for offline listening! My Favorites. 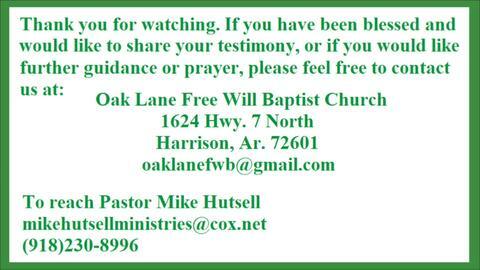 Access your favorite broadcasters, sermons, or speakers! Browse through the daily featured sermon. Browse through the News In Focus audio commentaries. 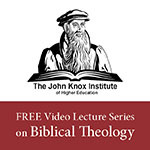 Browse through all newest sermons added. Browse churches by name, location, denomination. Use our Local Church Finder to find a good church! Browse or search by the speaker name. Browse through our recommended staff picks. Browse through member-recommended sermon picks. By TOPIC: Addiction, Biographies, Family, Money..
Browse sermons by foreign language. Online Hymnal + Psalter. Browse or search for a hymn! My Church gives you convenient, 1-click access to your home church! Browse our news feed with audio commentaries and user comments! Find local churches using your GPS with our interative map! Video streaming over 3G, EDGE, WIFI with selectable bitrate. Live video webcasting support with selectable bitrate! Roku & Chromecast & Fire TV integration! Enjoy SermonAudio on TV! Play sermons in the background while doing other tasks! Add user comments directly to sermons or news! And the best news is that this new service is completely FREE for all our broadcasters and listeners! We hope you'll enjoy this revolutionary new way of accessing some of the great preaching we have on SermonAudio! Your Favorites-To-Go! PLUS and FULL Members can access your favorite things on your Android device. A sermon you want to listen to on-the-go? Simply adding it to your "favorite sermons" on the site will bring it to your "favorite sermons" list on your phone! MyChurch 1-Click Access! Is your home church broadcasting on SermonAudio? Go to the "MyChurch" tab and type in your church's Member ID to jump straight to your own church's sermons! Don't remember the Member ID? Click on BROWSE to find it! 24x7 Radio Stream! You can now tune into our unique 24x7 Radio Stream for non-stop preaching+music enjoyment! Simply click on the RADIO icon located in the HOME tab and keep it running all day long -- perfect for those long commutes! Open Sermon URL With App! Now when you open a sermon link, you will be able to open the sermon directly in the native app to take advantage of far more features such as downloading, LIKING on Facebook, and so much more. Add User Comments! 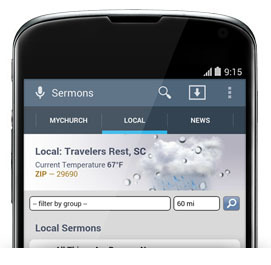 You can add user comments to sermons or news items directly from your phone! Enjoyed a particular sermon? Encourage the broadcaster, and add a comment. It's now easier than ever! A new evangelistic tool! People love to discover new apps for their Android phone, one of the fastest growing segments in the smartphone market. Introduce a friend to the free SermonAudio app and introduce them to the great preaching from your church! 12/27/17 - Version 2.9.5 adds further support for multiple radio feeds. And some fixes. 8/15/17 - Version 2.9.1 adds support for new QR codes for SermonAudio's Paperback Bible Project, a simplified interface for casting streams to television devices, a new featured items carousel, and several small fixes. And 2.9.2 is only some fixes. 5/11/16 - Version 2.9 introduces continuous-play and shuffle playback modes for downloaded sermons. Also, a new debug long-tap option is available for downloaded files to help our technical support answer your questions. And this version includes many fixes and improvements, including support for the Android 6 permission system. 1/6/16 - Version 2.8.1 updates the MAP code so that it runs faster and more native to the Android UI (Google Maps v2). 11/17/15 - Version 2.8 introduces support for sending video, audio, and live webcasts to Amazon Fire TV devices, as well as supplies a rollup of enhancements and fixes. 7/17/15 - Version 2.7.2 includes better speaker thumbnails and is a rollup of several minor fixes. 4/6/15 - Version 2.7 introduces the LOCAL tab, which highlights sermons and events from your local area, and includes a fix for an issue with how the sermon player's user interface updates. 1/27/15 - Version 2.6.4 fixes the app's notifications, as well as several other minor issues. 11/9/14 - Version 2.6 introduces support for Google Chromecast. Also, the audio player is now more robust, the audio player's notification + lockscreen has playback controls, links from the main website can open directly in the app, and numerous fixes were added to improve stability. Version 2.6.1 fixes a few minor issues. Version 2.6.2 fixes the metadata for the lock screen (and Bluetooth). 9/11/14 - Version 2.5.9 rolls up several fixes, including a battery drain issue. 7/21/14 - Version 2.5.6 introduces audio controls on the lock screen (for devices which support this Android feature), a map of your local churches at a glance at startup, an important fix for audio focus, and many small stability enhancements. Version 2.5.7 fixes a problem with audio playback during incoming calls. Version 2.5.8 has several stability fixes. 5/25/14 - Version 2.5.3 Version 2.5.3 fully supports Android 4 audio focus, adjusts network timeout to work better with satellite Internet connections, has a more robust offline mode, and has numerous fixes and stability improvements. 5/13/14 - Version 2.5 Version 2.5 features a QR scanner that allows you to quickly jump to any specific sermon by simply scanning the associated QR code from the website or from any other mobile device! 5/13/14 - Version 2.4 Version 2.4 includes the ability to export downloads to public storage and Android media player, improved searching with suggestions, grouping downloads by speaker, a better download notification, and several fixes and stability improvements. 4/17/14 - Version 2.2 Version 2.2 consists of fixes and stability improvements. 4/16/14 - Version 2.1 includes resumption of playback after network interruption, improved download notification, and numerous fixes for stability. Nook + Kindle tablet users now support MAPS. 4/2/14 - Version 2.0 is a major release that now supports both phone and tablet form factors (landscape + portrait modes). Audio, video, and PDF sermons can now be downloaded to the app for offline enjoyment. The app has been redesigned with native controls and largely rewritten for more robust support of the newer Android devices. Other improvements include: Player auto-resume, click title to jump to sermon, speaker + album graphics. 6/17/13 - Use the new "Email" button found on all sermon and news pages to more easily share items of interest with family. Also supports multiple recipient emails. 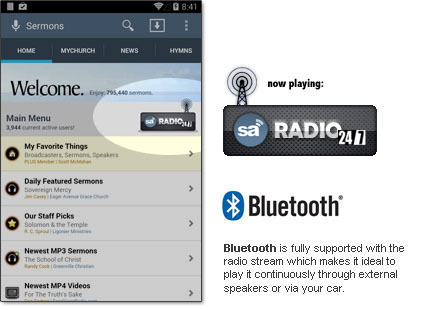 10/16/12 - Version 1.9.6 adds built-in support for our 24x7 Radio Stream providing non-stop preaching+music enjoyment anywhere you go at home or on the road! A new way to enjoy the riches found on SermonAudio.com! 10/6/12 - Based on user requests and respecting Android's own platform strengths, version 1.9 is now doing sermon downloads like it did before 1.8. When a sermon is downloaded, it is now placed directly into the native Music App. 1.9 also has numerous bug fixes and the graphics have been refreshed for higher resolution tablets such as the Nexus 7. 7/25/12 - Version 1.8 allows you to download MP3 sermons directly in the app to the new Downloads tab. Downloaded sermons can be optionally copied to the SD card. There are also general UI improvements. Daily Devotional is now moved to the Home tab. 4/6/12 - Fixed a bug with viewing PDF transcripts on certain Android tablets. Internal code support for Kindle Fire + Nook Tablets. 6/29/11 - Expanded the filtering options for many of the sermon search result lists in the app. Filter by speaker for videos, transcripts, Bible reference, and much more. Give it a try! 12/24/10 - Version 1.6.5 fix now supports automatic pause and resume of playing sermons when a phone call is received. 11/20/10 - Version 1.6 added support for background playback so that sermons will continue to play even when exiting the app, turning the screen off, or performing other tasks. 11/12/10 - Version 1.5 introduces Roku TV integration so you can easily play any selected sermon, video, or webcast on your television. 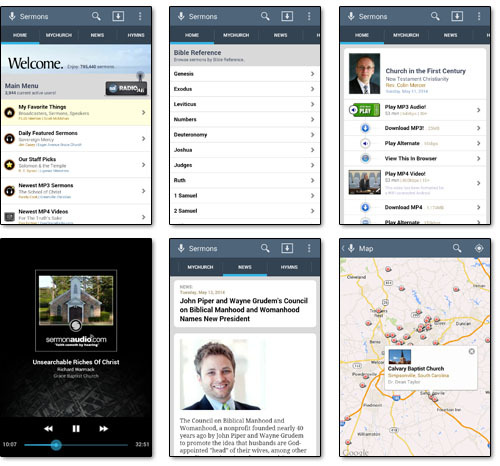 9/2/10 - Version 1.0-1.4 is launched and is our first-ever Android native app. Multiple bug fixes at initial launch brings us to 1.4. We hope you'll enjoy this new way to access SermonAudio! Please write us at support@SermonAudio.com for more assistance. How do I completely exit SermonAudio on my I-Pad when I am completly finished using it? SermonAudio Andriod Edition is not available on Google Play. I would also like to know how to tell the SermonAudio application to use my SD card for storage instead of internal memory. I tried downloading a video and it rendered my Tablet inoperable until I uninstalled the SermonAudio application. Android has the option to move applications to SD but the SermonAudio application does not appear to be compatible. Why must Google Play Store be used? Google accounts are the most perfect tracker. They personally identify users, track global position, business transactions, banking, credit card, medical information, Facebook, Twitter, etc. Basically having a Google account is required to use Google Play Store. Having a Google account means giving up all privacy. I don't have an account on my phone on purpose. I don't have a Google account on the internet either. The last one I had I canceled because they were reading my email sharing it with third party data and business, and sending me advertizing related to my medical issues. The last straw was receiving 40,000 redirected complaints in my email over problem android apps. Hope this helps dear friend, you can click where it says open browser, it will take to the sermon on your Mobile browser and there you can download it to your SD card! May God richly bless you. I've looked through all of the comments regarding the android apps, so I apologize if I've missed this, but is there yet any way to transfer the app or at least downloaded sermons to my sd card? When I long press on a downloaded sermon, and choose "external storage", I receive a message which says "Unable to copy to external storage. (Did you revoke Storage permission?)" I have no idea what that means. I send the sermons regularly to senior citizens via text with messaginger, these people don't have email or use the code. Is there a way to continue to use messaginger? I use it for my texting but it isn't offered by the sharing options. Please advise I look forward to hearing from you soon. I have the sermons app installed on my Android phone and I love it! However, I am having one issue. After I download a sermon and listen to it. The app won't allow me to delete it from my phone. I tap on the sermon, then tap delete, nothing happens. What needs to be done to fix this issue? Thank you. Let me know if this solved your issues. Using the Sermon Audio app, you can go to your downloads by clicking on the downward pointing arrow in the top right of the screen. Now that you can see everything you've downloaded, you can long press on a sermon which will bring up a context menu. You should see two options to either move the sermon to public storage or move to your Android music player. Choose.to move it to the Android music player and you will find the file in the "music" folder of your device. From there, you can do what you want with it. I would also benefit from learning this. I've tried everything I can (including Google searches on Android esoterica). I would also like to discover where in internal (?) memory the sermons/downloads from SermonAudio are stored so that I can play them back with a different audio player. Hi, Thanks so much for this app is has been one best things ever! Help! I've been enjoying your app for a couple of years now - I listen to sermons daily on my HTC one M8. It has worked perfectly until last week. The app no longer will launch. I've uninstalled and reinstalled even trying the Legacy edition. Legacy will launch but freeze before actually playing the sermon. Newest edition looks like it will launch, then the screen will return to previous screen before opening the app. Legacy edition, I can actually choose the sermon and even get to the "play" screen. After pushing "play" it will freeze. Any ideas?!? I have been using your android app and love it. Are you ever planning on making poster's post histories available on the app? It would be very helpful I think. O well, God bless you SA! Thanks for this app, it has been a blessing. I am having trouble on HTC One m7 GPE running android lollipop. After I am done using the player, the playback controls no longer show on the notification/lock screen (this is what I would expect). The problem is that at some random time later (usually within an hour) the playback controls shows back up in the notifications area and cannot be dismissed or hidden. It seems to me it should behave more like the google music app which only shows in the notification while playing or paused, and if it is paused it can be dismissed.